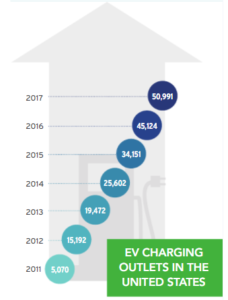 In October 2017, the Electric Vehicle Charge Association (ECVA) released its State of the Charge report, which included several positive predictions on the EV market. The U.S. just surpassed 50,000 charging stations in 2017 and there are nearly 700,000 electric vehicles are on the road today. Annual sales are expected to reach 1.2 million by 2025 or approximately 7% of the total auto market, at which point there would be an estimated 7 million EVs on the road. The report predicts that the global market for EV charging infrastructure will grow an outstanding 46.8% annually from 2017 to 2025 and reach over $45 billion by 2025. In the U.S., revenues have increased by 576% over five years from $27 million in 2011 to $182 million in 2016. California is the clear leader in EV adoption, accounting for 54% of electric vehicle sales, but only 12% of the total market. The state has seen its number of charging stations increase from 1,300 to over 15,000 today. Thirty cities in California have shares of EV sales that amount to 8 to 25 times the 2015 national average per capita, including Los Angeles, San Francisco, San Jose, and San Diego. San Jose has the highest EV share and charging stations per capita than any other city in the U.S. California EV charging infrastructure growth has been boosted by the recent settlement with Volkswagen related to their diesel emissions issues. The settlement resulted in the $800 million Electrify America plan that will be deployed over the next 10 years. The report notes that the strategies deployed in California could be an effective playbook for other regions. 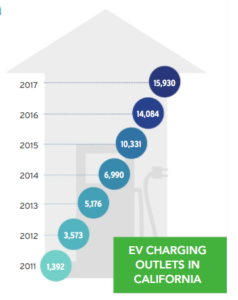 Even with an estimated 80% of charging still done with home EV charging stations, plans to deploy public and private stations in high traffic commercial areas are critical to driving adoption and getting consumers past “range anxiety”. An important component of planning is a focus on lower-income communities and Volkswagen has promised that 35% of the Electrify America plan will go to disadvantaged communities. California is also home to the headquarters of the leading EV charging station companies – Chargepoint, EVConnect, EVgo and SemaConnect operate nearly 50% of all public and private charging stations in the U.S. and 57% in California. International companies have recognized the potential for charging infrastructure in the U.S. as well with Enel, one of Eurpoe’s largest power companies, recently acquired eMotorWerks, a California-based company that makes the well-known JuiceBox EV charger.